*** Sic the nuns on em:)!!! The Democrats are denying the Republicans the quorum necessary to vote on key fiscal legislation. Hopper has received threatening phone calls and e-mails. These are threats of a physical nature. “We are working with law enforcement in my district. They are watching my home and my business.” Other Republicans have had their homes and businesses threatened, too. The unionists have demonstrated outside those homes and businesses. Linked by Pundit & Pundette, thanks. 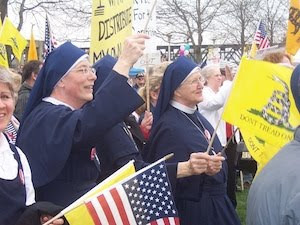 More newsworthy links there, including this much-anticipated Tea Party vignette:) ...And a proud TrogloPundit:) Hey, I was born a cheesehead, I'm taking this proud personally:) Go Scott Walker!! !